Have you ever wondered what it would be like to travel to Mongolia? What are the things to experience in Mongolia? This country surely is a destination off the beaten track and not many people travel here. I think it should be on everyone’s bucket list because Mongolia is nothing like any other country you have experienced before. When I travelled to Mongolia on the Trans-Mongolian Railway, I didn’t know much about the country or its people. I knew it was a secluded country with harsh winters and hot summers. I booked a 1 week tour of the Southern Gobi Desert to experience the country and the Mongolian people. Check my post on 10 things to do in Mongolia in 2 weeks. I travelled over a week through the country from its capital Ulaanbaatar to the very south of the Gobi desert, I experienced some things I didn’t expect before I travelled to Mongolia. I feel that those astonishing experiences hold the key to the beauty of the country therefor I share my experiences with you. What do you think travel in Mongolia will be like? Make sure to read the things to know before you go. One of the things to experience in Mongolia has to be the capital: Ulaanbaatar. It is a city with roughly 1,4 million people, almost 45% of the country’s population lives in this urban environment. The city quickly expands because new roads and huge apartment buildings are built everywhere. Most of the big blocks of flats are ready but empty. They’re waiting for people to move in, but the truth is, not many Mongolians can afford a modern apartment like that. It’s possible to see huge apartment buildings with an indoor department store where you can buy close to anything, and tucked away, in the shadow of the big flats, you will see a patch of land with a traditional ger tent. Although people have abandoned the nomadic lifestyle, they still keep their ger tent because it’s in the family for ages or for the simple reason people cannot afford an actual home of bricks. Although Ulaanbaatar is one of the most polluted capitals in the world, it is worth to stay for a day or two and just walk around the streets. Try to find the softest Kashmir sweater or phone home from a “phone booth” on the sidewalk. The National Museum of Mongolia houses an interesting collection of artefacts about the history of Mongolia as well as some dinosaur fossils and meteorites found in Mongolia. I didn’t know anything about the religions in Mongolia. Surprised, I walked past a Buddhist temple in Ulaanbaatar. I visited the Temple of Boddhisattva Avalokiteshvara at Gandantegchinlen Monastery, where I first encountered this peaceful religion. The temple itself was dark and only lit by hundreds of small candles, with the large statue of the Buddhist leader in the back. After 1 day in Ulaanbaatar, I met with our tour guide and driver, who would take me on a 7-day tour around the country. The driver didn’t speak any English, but the tour guide spoke it well enough for us to understand each other. During many conversations at night, I’ve learned that the driver was an atheist, which is not uncommon, but our guide was Islamic. During our tour in an old Russian 4×4, we encountered many religious shrines along the way. We stopped at the most important ones. These shrines or landmarks are called “ovoo”, a sacred cairn, made of wood, rocks and other things lying around. It’s a typical shamanistic shrine, to mark the highest point of a mountain or they are used to mark an important crossing. You walk around it 3 times, counter clockwise, and normally you add something to the cairn, like a rock or a soda can. Although the city of Ulaanbaatar is nice, the main things to experience in Mongolia lay outside the borders of the city and deep into the country side of Mongolia. What better way to explore Mongolia than with Road Trip to the Southern Gobi Desert? 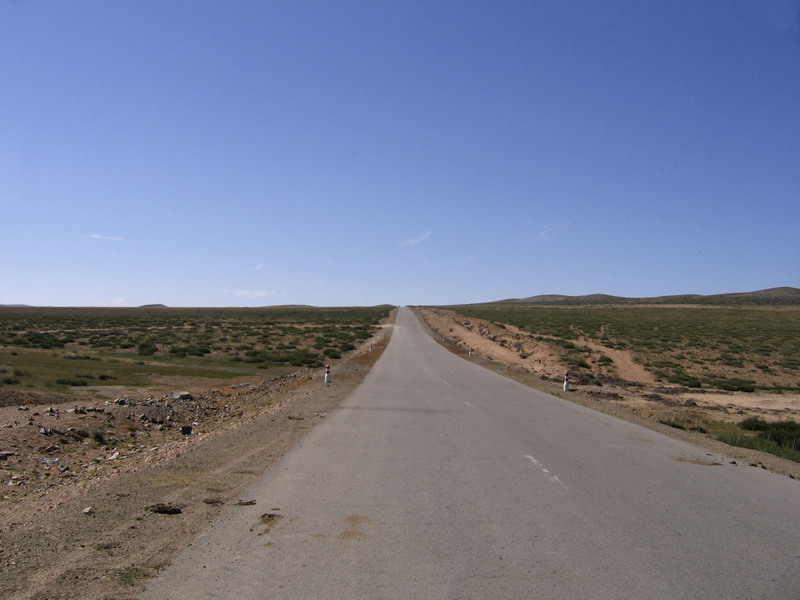 Mongolia has scarce amount of roads and many lay in and around Ulaanbaatar. They expand the road network but not far out of Ulaanbaatar our tour group ran out of paved road. The roads through the grass lands and steppe of Mongolia are nothing more than a dirt road or sometimes not even that. They were hardly visible strings of dirt between the patches of grass. There were potholes and little hills, which we took with seaming less effort. Usually, I doze off when travelling in a moving vehicle, but not in Mongolia. We bounced inside the truck with every bump in the road. My teeth clapping inside my mouth because we broke the suspension early during our tour. We had 5 flat tires and had to stop for 3 more “emergency repairs” to the car. We got gas from a man standing in the middle of nowhere who had a big oil drum. But, it didn’t really matter how bad the roads were or how beat up our car was, because our driver got us there in the end, He really knew the way, without a map or any signs of direction. We saw numerous valleys, mountains, lakes, streams and even some wild animals. Music plays a huge part in the life of the Mongolian people. During our 7 days inside the 4×4 we only had 1 mixed tape to listen to. The throat-singing, called “khoomei“, (click the link to hear some khoomei singing from YouTube) annoyed me at the beginning, but as we moved further into the Gobi desert it was the perfect background music to the landscape which unfolded in front of our car windows. When we stayed with a local nomad family, we didn’t have much to do after the sun set. After diner, the family called us into the main tent. 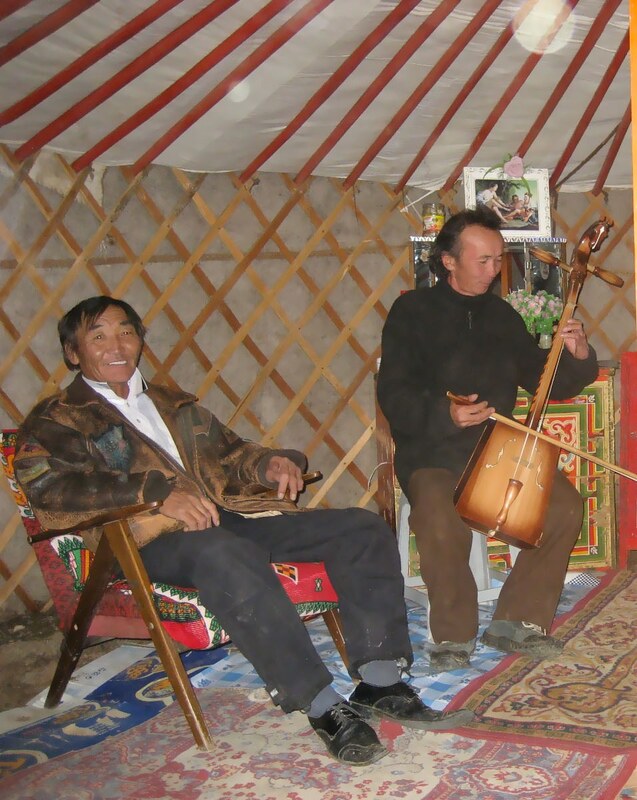 They fired up the lights of all the trucks in the camp and the old man of the tribe, played his “morin khuur”, translated as a horse headed fiddle, an authentic instrument of Mongolia. 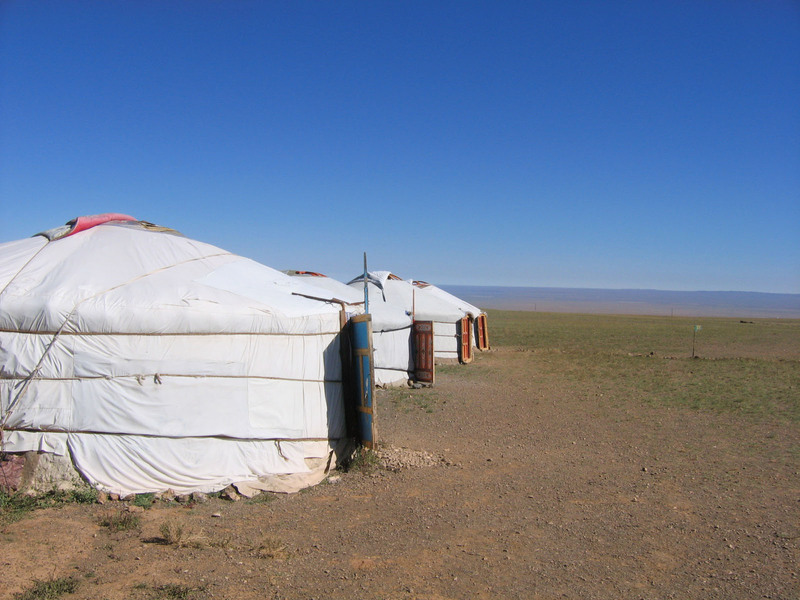 Almost 25% of Mongolians still live a nomadic or semi nomadic life. They live off the land and herd their goats, sheep and camels. They trek from one fertile patch of grassland to another during the short summer and might reside on 1 steady place during winter. Mongolian people live inside a tent, called a ger tent. A round structure made of wood and canvas which protects them from the harsh conditions on the steppe of Mongolia. I got really nervous when I needed to pack up my stuff and move to another home, but these people do it on a weekly or monthly basis. They can dismantle the whole ger tent in less than 30 minutes and assemble it again in the same amount of time. 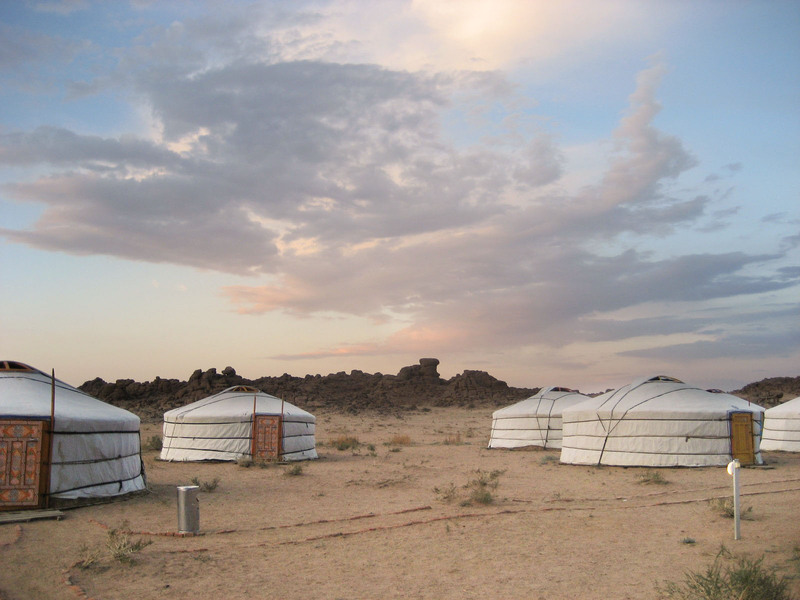 During our stay in the Gobi desert, I stayed 2 nights in the ger camp with a local nomad family. I went out with the young boy to collect the goats, got water and did some chores around the tents. Although conditions were more than basic, it was very intriguing to see how they were able to sustain theirselves on barely anything. It’s one of the main things to experience in Mongolia and I recommend it to everyone. It makes you value and appreciate the western comforts, which we take for granted every single day, even more. I felt really blessed to be welcomed into the lives of this nomadic family, who opened up their home to me. Nothing can prepare you for the food in Mongolia. 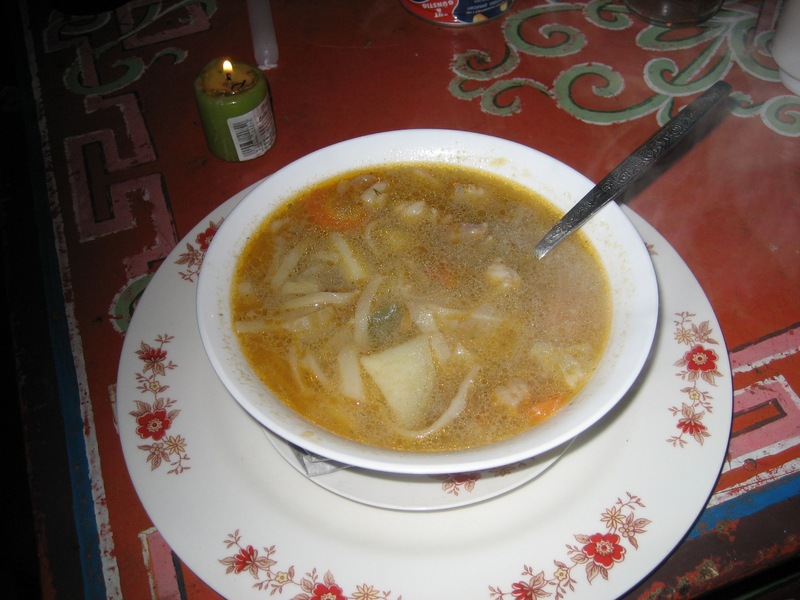 The Mongolian cuisine is not known for its sublime recipes. Fruit and vegetables are sparse, because the climate is harsh and not many things will grow. Many Mongolian nomads depend on their herds and people in the city depend on the import from countries like Russia and China. During my tour in Mongolia, all meals and drinks were included. We stopped outside Ulaanbaatar at a supermarket to stock up on water and crackers, but we ate with the locals when we were on the road. And with the locals I mean: we ate local food. Our first stop was for a lunch break at a dingy shack along the road. A big pig was grubbing in the dirt and they invited us inside. We didn’t have a menu; they only served steamed dumplings, called “buuz”, which consisted of some mouton meat and a lot of mouton fat. The dough was cold and the whole thing felt like a big lump of fat inside my stomach. I was very hungry though and with some ketchup, I managed to eat 1,5 of my first “buuz”. During our stay with a nomad family, deep in the south of the Gobi desert, I tried some of their famous dried cheese, which was alright. We were also served another popular Mongolian dish: “lapsha”, this is a simple noodle dish. The noodles were alright, the fact that they were boiled and served in local water, was something that influenced the remainder of my stay in Asia. Travel is not all about the great things, the food of Mongolia certainly was one of the worst things to experience in Mongolia. But, as the good, the bad is also part of the unique travel experiences. What are your experiences with Mongolian food? When you say Mongolia, you say horse riding. Mongolians are born in the saddle and one or more of these short little horses is a must have for many nomadic families as it’s their only means of transportation. I saw children as young as the age of 3, who could barely walk, jump on the horse and ride along our jeep. They have no fear and ride without a saddle. During the Nadaam festival in July, they organize competitions across the country. The Mongolian people compete in horse races but not the kind we know, but running in gallop across the fields and steppe. 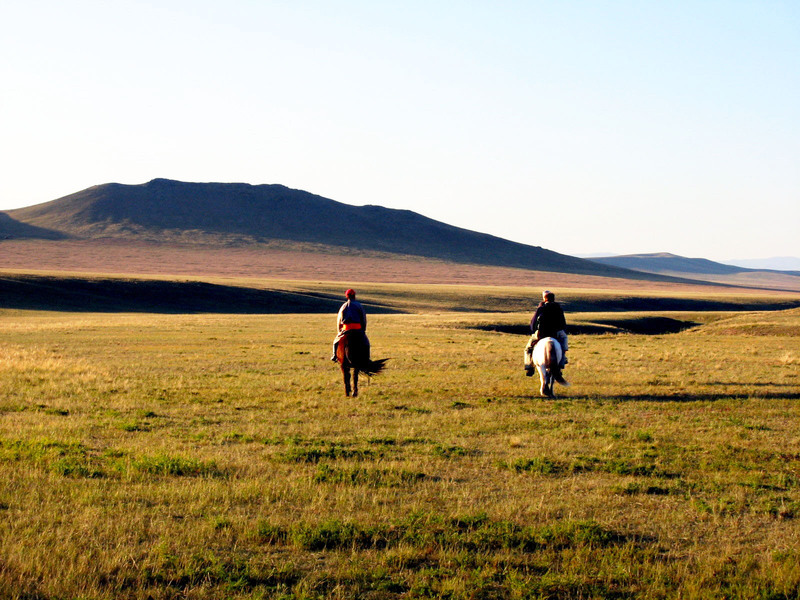 What better place to go horse riding than in Mongolia? I managed to ride twice, one time on this lovely white little horse called Bor, which led me into a canyon, looking for eagles. Another time, I rode on the plains of Hustai National Park. As a storm was coming, my horse went into a steady gallop and I couldn’t stop laughing. It was such a liberating feeling to let go and let the horse take me away. While the sun sett and the grass coloured a golden shade of orange, I rode my horse into the Mongolian sunset. I felt truly blessed to experience this beautiful but harsh country and I was delighted to be able to ride a horse in the country of horsemen. Were you able to go horse riding in Mongolia? Let me know in the comment section below. Mongolia offers a wide variety of landscapes. There are green lands with waterfalls in the north, vast mountain ranges on the border of Russia but the Gobi Desert is not like any other desert you would image. It’s 1,295,000 km2 (500,000 sq. mi) and it is the fifth-largest desert in the world and Asia’s largest. The Gobi Desert is so dry because of the shades of the Himalayan Mountains which block all the rain. Although you might think of endless sand dunes, the Gobi desert is mainly eroded rocks in all kinds of shades. When our tour group crossed the desert, we saw some black-tailed gazelles and we encountered many camels. Some were domesticated, as their feet were tied together, but we also saw a wild herd in the distance. The Gobi desert was an unforgettable experience. The land changed colour every few miles, rocks turned from red, to pink, to orange, to yellow and back to red. The sunsets were astonishing and after every hill came another one. We travelled over silky roads of sand, avoided streams of gravel and rocks, navigated across small grasslands and fields covered in tiny little flowers covering the whole spectrum of pastel colours. And we rode along streams and lakes, where animals drank and saw many birds of prey, trying to catch a meal. We endured 1 sandstorm, sat out 3 thunderstorms, were cut out in 2 downpours but we mostly saw bright blue skies as far as the eye could see. The Gobi desert is on the top of my list of things to experience in Mongolia because after travelling over 1,700 km (1,057 miles), I still didn’t get bored from looking out of the window and see this vast country unfold its hidden beauty in front of my eyes. Mongolia is one of the largest land-locked countries in the world, tucked away between the giants Russia and China and not close from Kazakhstan. It takes you 5 days on a train from Moscow and 3 days on a train from Beijing to get to Ulaanbaatar. You can fly to Genghis Khan Airport but it will cost you and you have to take multi transfers to get there. But that’s just to get the capital of Ulaanbaatar. There are 2 railroads across Mongolia and a few paved roads connecting to the capital. The rest of the country lies many days driving apart from each other. The whole country is isolated, especially in the winter when average temperatures drop to -30 degrees Celsius/ -22 Fahrenheit and people only head out when they absolutely have to. One of the things to experience in Mongolia is the desolate landscape. You never really know the true meaning of desolation until you experience it first-hand. There is no Wi-Fi or even cell phone services in the Gobi desert, although things might change over the years. We were on the road for 6 full days and during 2 of those, we didn’t see a single soul. We were all on our own. 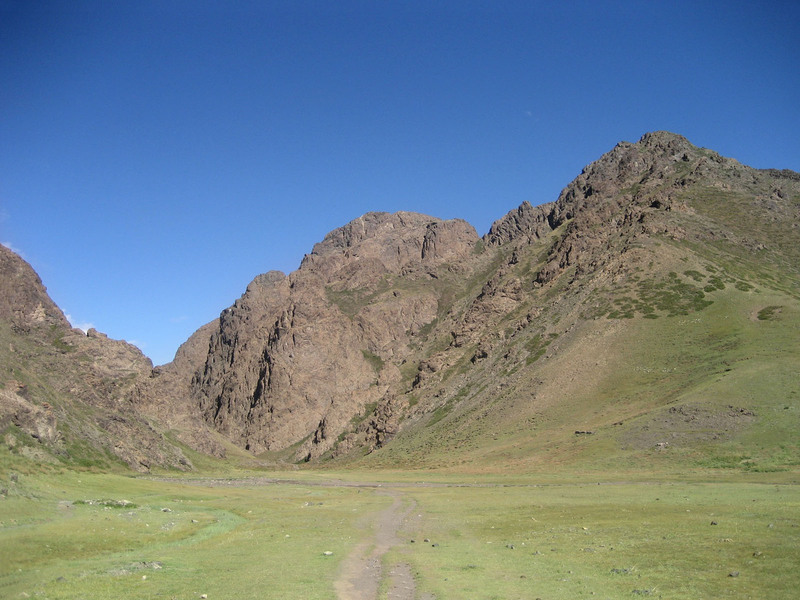 I truly experienced the bare and harsh conditions of the Mongolian nomad people, when I got sick during our tour. My stomach got very upset which resulted in an instant fever. Although the ger tent I was staying in was warm and comfortable, temperatures dropped already to -5 degrees (23 F) in September. I was so cold and I couldn’t get warm. I had to go outside and run to the hole in the ground that served as a toilet. No other protection than 1 thin sheet covering only half of the hole. To sum things up: It was the worst night of my life. I was so relieved to see the sun rise, because that meant the cold would soon be chased away by the morning sun. You’d think, it was a horrible experience and I wouldn’t advice anyone to get sick in the Gobi desert, but when I look back on it, I just feel really blessed to have experienced it. We were so remote from any kind of civilisation; it was not an option to go back. So we continued our journey across the Gobi Desert. I was absolutely miserable but I felt very much alive. I experienced first-hand what basic conditions actually mean. How to make do with the things provided by nature. And of course, I was more than ecstatix when I could take a shower and I got a hot stove inside my ger tent a few nights later. Tap water coming from the faucet is such a privilege, a flushing toilet is such a luxury and a warm house to sleep in is a true blessing. Check this funny post from Longest busrides about toilets in Mongolia. Although my experiences in Mongolia might seem awful, looking back, I think it was one of my most treasurable memories of my trip. I got to see and experience the isolation of the Gobi Desert in all its beauty and remoteness. I experienced 6 gorgeous sunsets and met some amazing people, who genuinely cared about my well-being. Mongolia took a piece of my health, but mainly a huge chunk of my heart. 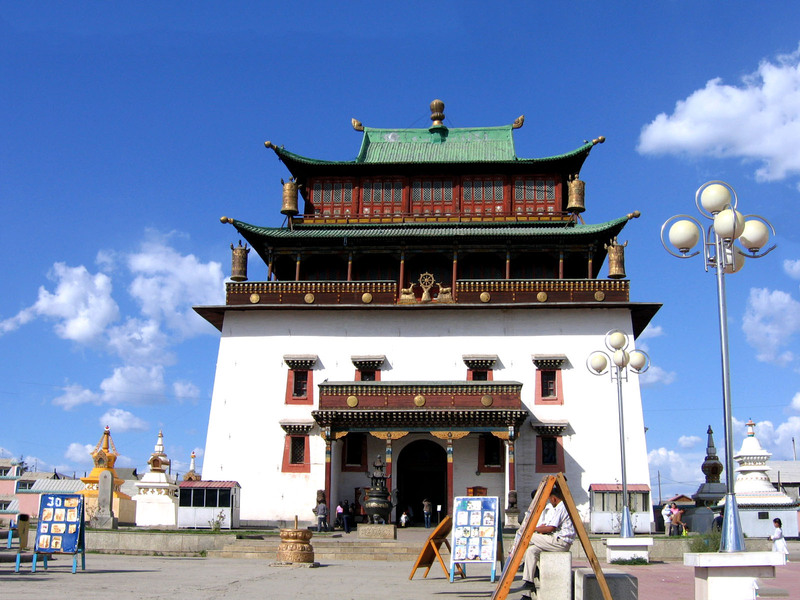 If you want to know more about Mongolia, read my top things to do in Mongolia. Have you ever been to Mongolia? What are your experiences with this amazing country? Please let me know and leave a comment in the comment section below. I was in Mongolia last April and didn’t like the food at all 😀 The country and people themselves are super kind and beautiful, but the food.. oh god.. In UB though there were ethnic restaurants, for example I really loved the Hazara restaurant called Mughul! But when we were visiting Mongolian restaurants and local people in ger, those meal were.. quite interesting. No flavors at all, and nothing but loads of fat saturated meat! But I’m glad of that experience still. Hi i am curious to know how you arranged the tour off to the desert and what you think we can do if we going to be there in high winter? Hey Keyla. How cool you’ll go in the winter! I arranged the tour at home but we could book the same tour via out hostel in Ulaanbaatar. Don’t think they run in wintertimes. Maybe closer to Ulaanbaatar or more to the north. Oh, I’m so sad hearing that you didn’t get any good Mongolian food. I loved the dumplings in milk tea. Also, in the capital I went to a very good restaurant, and the tongue was delicious (not sure which animal). My favorite was the yogurt, and on my 5-day horseback ride, my guide figured out that I liked it, and he made sure I got 2 or 3 big bowls each day. (I didn’t need that much yogurt, but I wasn’t sure how to politely refuse, since no one spoke English and the words weren’t in my phrasebook. How do you find your tour guide and driver? I’m interested in a similar trip, but am overwhelmed with the idea of trying to find someone. Hi Jes. Thank you for your question. Do you know what you’d like to see or do in Mongolia? I recommend to make a list of what you want to do. You can always go to an agency in Ulaanbator or check with you hostel if they know people for tours you could join. If you have a fixed time frame you can check with mongolian touragencies in your home country. You might pay a little bit more but then it’s sorted. Let me know if I can help you in any other way. It was the strangest desert I’ve been to for sure Ami! It sparked my wanderlust to discover more desert of the world.